Ex Police Constable and Mrs Hurren, of 2, Clifton Villas, Yates Hay Road have heard that their son Pte Alfred George Hurren, 22 of the Coldstream Guards has been killed in action. 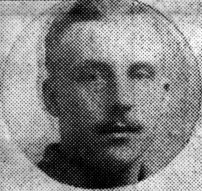 Pte Hurren joined the army in May 1915, possibly under the Derby Scheme as he was not mobilised until 1917. He was a policeman and joined the Worcestershire Constabulary in January 1917; prior to that he was a postman. The first news was received from a Corporal who states he was on of the best bombers and is greatly missed.